Full spectrum with on/off Switch and IR, help plants&flowers grow faster and make sure higher THC in the harvest! Deeper penetration of 5 watt Epistar chip. High par and High Lumen, 100% lumens output and Optimized Driving current increases diode efficiency and output. Quality Parts-Power supply, Fans & wire are Fire-resistant material, more safe! High-quality aluminum board that dissipate heat much more efficiently. All items are CE and RoHS certified. 1 Seeding / Breeding/ Veg/ Flower/For all planting stages / Green Vegs / Flower Plant / Fruit Plant / Herbs / Medical / Meat Plant etc. 2 Hydroponics / Horticulture / Indoor plants / Greenhouse Lighting / Pot Culture / Farm / Water Soluble Breeding / Pipeline Cultivation etc. 3 Exhibition / House Garden / Bonsai / Home / Commercial Crops / Project / Personal Growing / Urban and University Research ect. 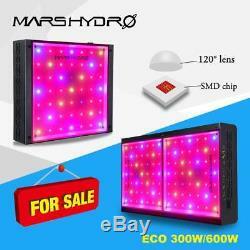 Mars ECO 300W LED Grow Light. Model: Mars ECO 300W LED Grow Light 12 Band Full Spectrum with on off Switches High Lumen Output, Great Coverage, Deep Penetration, Super Harvest. Spectrum: White, 430440nm, 450475nm, 620630nm, 650670nm, IR 730 nm (Best spectrum for all stages of your plant growth and bloom). LEDs Brand: High efficiency 5W Epistar (HI-LED) High Intensity. Core Coverage: 0.5m × 0.5m= 1.7ft × 1.7ft. Max Coverage: 1m × 1m=3.5ft × 3.5ft. Panel Size: 11 x 10 x 3 inches. 5.3 lbs / 2.4 KG. View Angle of leds: 90°/120° Mixed. Thermal Management: Cooling fan+Aluminum heatsink. Safety Guaranteed: CE and RoHS certified. Plug has passed worldwide safety standard. BSI in UK, VDE in EU. Mars ECO 600W LED Grow Light. Model: Mars ECO 600W LED Grow Light 12 Band Full Spectrum with on off Switches High Lumen Output, Great Coverage, Deep Penetration, Super Harvest. Core Coverage: 0.6m × 0.9m= 2ft × 3ft. Max Coverage: 1m × 1.6m=3.5ft × 5.5ft. Panel Size: 20 x 11 x 3 inches. 9.5 lbs / 4.3 KG. PH Value: 6.06.5 in soil. 5.76.0 in hydro/DWC. More cal and mag than usual. The light is not water-proof, so do not use it under water environment. Cut off power before installation for safety guarantee. Light must be used under stable voltage, instability affects working life. Do not expose the light under the environment of sulphur or acid. The light is not waterproof, so do not use it under water environment. For this listing, your order quantity is 1. 1 box contains 1 light+1 set hanging kits+1 power cord. US/CA buyers will get US power cord. EU buyers will get EU power cord. Pro II Cree LEDS 600W. Pro II Cree LEDS 1200W. 27'' × 27'' × 63'. 2 x 3'', 2 x 6", 1 x 8". 70 KG / 154 lbs. 39'' × 39'' × 70'. 2 x 3", 4 x 6", 2 x 8. 1 front door, 2 half-moon zipper doors. 2 x 3", 6 x 8", 2 x 10. 2 x 3", 2 x 8", 4 x 10. 48'' × 24'' × 70'. 2 x 3", 2 x 6", 1 x 8. 50 KG / 110 lbs. 1, The authorized distributor of Mars Hydro ------ Since 2009 Mars Hydro LED has been a reliable supplier in the design and manufacturing of innovative high-power, high-yields, truly full-spectrum LED grow lights. 3, ETL certified to UL safety standard. 4, True full spectrum for ultimate flowering and vegetative plant cycle. 5, Saves on electrical , cooling and bulb replacement costs Once you grow with Mars LED grow lights, you'll understand why people say HID is a thing of the past! If you don't need it, please inform us within 7 days. Don't forget that good communication can solve all problems. In the first year, we send you free parts for repair or you return it to our service center. Sulphur or anything that is caustic is forbidden. Sulphur reacts to moisture in the air forming sulphurous acid that corrodes the metal. Stop using the light when the fan stops spinning. This is because the light without the fan could not cool itself efficiently. Maintain stable voltage to avoid damage to the light. Light may be too strong, please wear your sunglasses when looking at it. The item "Mars Hydro Eco 300W 600W LED Grow Light Full Spectrum IR Indoor Plant Veg Flower" is in sale since Wednesday, August 15, 2018. This item is in the category "Home & Garden\Yard, Garden & Outdoor Living\Gardening Supplies\Hydroponics & Seed Starting\Grow Light Kits". The seller is "happygrowhydro" and is located in Los Angeles, California.